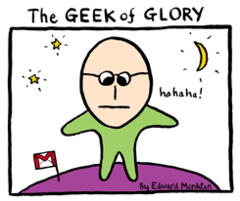 Does opening your gmail inbox turn you into a Monkey of Madness? Or the Elephant of Overshare? Perhaps as a Shiny reader you’re more of a Geek of Glory. It’s all part of Google’s cute and friendly initiatives, little clever ways products like Gmail can be customised. Cunningly each character type links up to a Gmail function or application: Gmail Labs for Geeks, Video chat for Elephants etc. Apparently, the categories reflect the way Gmail actually considers its users. “Giles Andreae has very creatively captured five prominent email personas — the same kind of characters that we keep in mind when we build new features,” said Christian Miccio, Product Manager for Google Mail. And Giles? Well he thought that the “drawings are a great way to add some more personality and left-field fun to the digital space”. If famous novels were iPhone apps, what would they do?